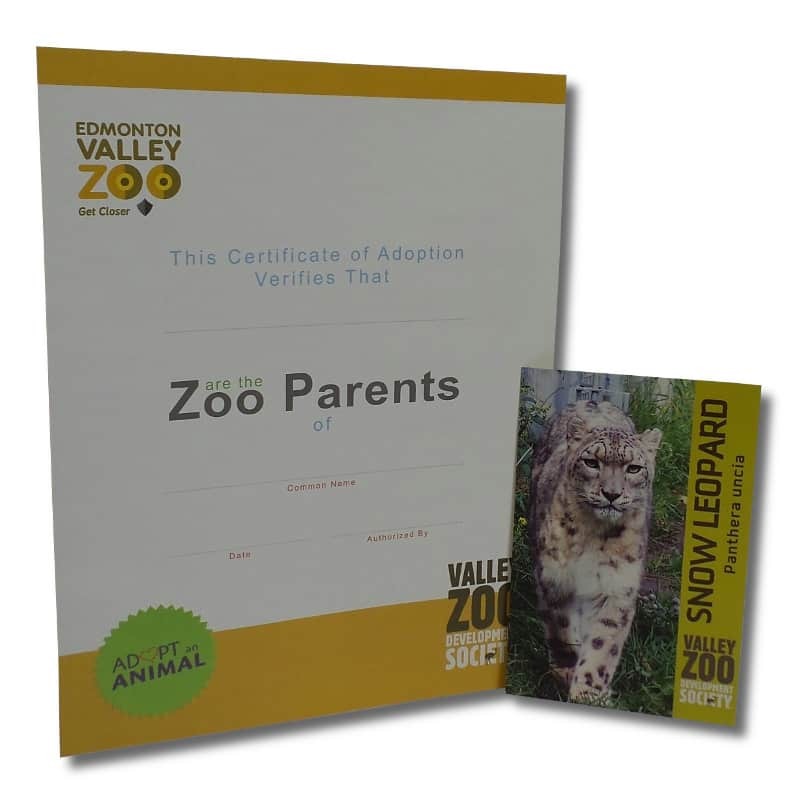 The Valley Zoo Development Society’s Adopt an Animal program inspires people to improve and enrich the lives of the animals in the Edmonton Valley Zoo’s care. Adopting one of our special animals provides vital funding for improved habitats and enrichment materials. Absolutely anyone can become an Adopt an Animal parent and help to cultivate the nurturing environment and inspiration our animals deserve. DISCOVER THE JOY OF OUR ADOPT AN ANIMAL PROGRAM! A Zootique Store Gift Card of $25, $50 or $100 for purchases in the Zootique Store. Increase the total amount of your donation by $10.00 or more, and recieve a tax reciept for the total donated amount. * PLEASE NOTE: ALTHOUGH WE TRY TO PROCESS ORDERS AS QUICKLY AS WE CAN, ORDERS MAY TAKE UP TO A WEEK TO PROCESS. IF YOU SELECT “PICK UP” AND “PAYMENT ON PICKUP” DURING CHECKOUT YOUR PACKAGES WILL BE HELD FOR A MAXIMUM OF 90 DAYS; PLEASE SCHEDULE PICK UP WITHIN THIS TIME FRAME, OR YOUR UNPAID ORDER WILL BE CANCELLED. ** This package is not eligible for a tax receipt, unless you have increased the donation amount by $10.00 or more. Gift card and zoo pass purchases are not eligible for tax receipts. If you add these options, a tax receipt will only be issued only for a tax-receipt eligible donation amount. Tax receipts are sent out shortly after the Adopt An Animal package is shipped.